The Society holds a treasure in its hands. […] Our fondest wish is that the official Church will stop considering Tradition as a burden or a set of outmoded old things, but rather as the only possible way to regenerate herself. However, major doctrinal discussions will not be enough to bring this work to completion: first we have to have souls ready for all sorts of sacrifices. This is true both for consecrated persons and for the lay faithful. AMEN. This is what so many of you do for me every day. The less connected we are to the Internet, the more we will rediscover peace of mind and serenity of judgment. The fewer screens we have, the better we will be able to make an objective evaluation of the real facts and of their exact import. Now the problem is right here, always at the same place, and we cannot shift it to somewhere else: what is the dogmatic authority of a Council that intended to be pastoral? What is the value of these new principles taught by the Council, which have been applied systematically, consistently and in perfect continuity with what had been taught by the hierarchy that was responsible both for the Council and for the post-conciliar period? This real Council is the Council of religious liberty, or collegiality, of ecumenism, of the “living tradition”…, and unfortunately it is not the result of a wrong interpretation. The proof of this is that this real Council has never been rectified or corrected by the competent authority. It conveys a spirit, a teaching, a way of thinking about the Church which are an obstacle to the sanctification of souls, and its tragic results are right before the eyes of all intellectually honest men, of all people of good will. This real Council corresponds at the same time to a doctrinal teaching and a lived-out practice that have been imposed on the “People of God”; we refuse to accept this as just another council like the others. This is why we discuss its authority, but always in a spirit of charity, for we want nothing but the good of the Church and the salvation of souls. Our discussion is not a mere theological joust and, in fact, it has bearing on subjects that are not “debatable”: the life of the Church is at stake here, indubitably. And that is what God will judge us on. At Mass, the faithful discover the echo of the ephpheta, “be opened”, pronounced by the priest at Baptism. [Optional in the Novus Ordo.] Their soul is opened once more to the grace of the Holy Sacrifice. Even when they are very little, children who attend Mass are sensitive to the sacred meaning that the Traditional liturgy expresses. Above all, attending Mass makes fruitful the life of married couples, with all its trials, and gives it a profoundly supernatural meaning, for the graces of the Sacrament of Matrimony flow from Our Lord’s sacrifice. Attending Mass is what reminds them that God wants to make use of them as cooperators in the most beautiful of His works: sanctifying and protecting the souls of their children. You mean… you don’t think she is “normal”? So, reading the whole of the interview – worthwhile – you get the sense that the brakes have been applied and a strong spiritualized approach is underway, at least from the office of the Superior of the SSPX. This entry was posted in SSPX and tagged Fr. 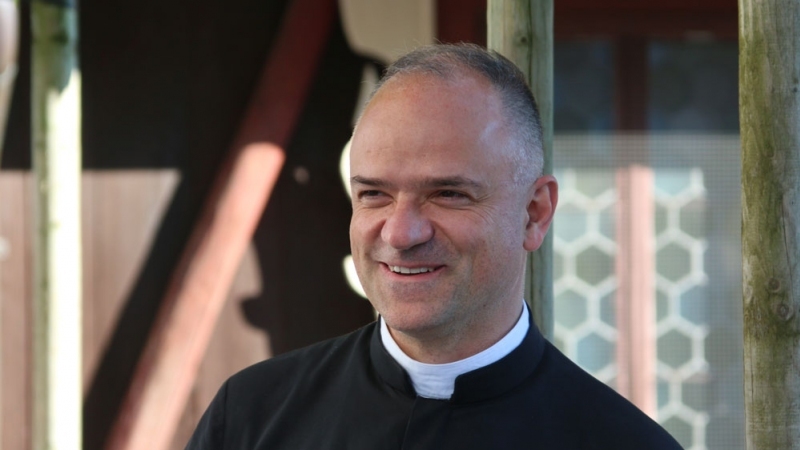 Davide Pagliarani, SSPX. Bookmark the permalink. Beautiful. Just beautiful. And they say these guys aren’t Catholic. It sounds Catholic to me. The SSXP Superior and the President of the United States are more Catholic than the Pope. Clear. Precise. No fluffy doublespeak and ambiguities. Calling it straight. Compare the above to the Instrumentum Laboris of the Youth Synod. Last year I received a letter from Ecclesia Dei. They clearly state that a Catholic may not fulfill neither a Sunday nor a Holy day of obligation mass by attending an sspx mass. [When I worked at “Ecclesia Dei” that was NOT the position of the Holy See. One could, and to my mind can, fulfill one’s obligation. I would like to see a copy of your letter.] However they do retain [?] jurisdiction given directly from Pope Francis to administer validly and licitly the sacrament of penance. In addition they may, with permission of the Ordinary, witness marriage vows. They may celebrate the Nuptual Mass. I wouldn’t give a whole lot of weight to anything coming out of the Vatican these days. The walls have been breached – were not under normal operations. Twilight Zone comes to mind. SSPX are good Holy men with valid Sacraments. A few thoughts come to mind reading this. (1) Fr. Pagliarani’s comments about the Second Vatican Council need to be put in context next to the 2011 unofficial “debate” between Msgr Ocariz and Fr. Gleize (SSPX) . Msgr Ocariz published a piece in the Osservatore Romano in December 2011 that was unofficially intended as a response to the doctrinal discussions going on at the time with the SSPX. Fr Gleize published a sort of rebuttal. That has basically been the sticking point ever since. The new Superior General’s comments on what is the “real” Council and the quote about “not the result of a wrong interpretation” are very heavy with meaning when understood in light of what the SSPX rejects. Msgr Ocariz proposed a solution based on the distinctions of the levels of assent due to the varying levels of pronouncements of the Second Vatican Council, and a “unitive interpretation.” Fr Gleize refuted that solution, essentially affirming a fundamental contradiction in the Vatican II documents that no interpretation can ever fix. (2) There is a debate ongoing within the SSPX about the hermeneutic of continuity and the hermeneutic of rupture. Few view favorably Benedict XVI’s version of the hermeneutic of continuity; perhaps a few more view favorably Gherardini’s version. In any case, such favorable views are not dominant. Fr. Pagliarani’s words here should probably be understood as representing a victory for the partisans of the hermeneutic of rupture. (3) Because Fr. Pagliarani says these things about the Council in response to the question about the SSPX relations with Rome, it would seem that the essential argument is that this difference of opinion about how to interpret the documents of Vatican II justifies an irregular canonical situation. This probably needs to be put in context next to the July 2016 declaration of the SSPX meeting of superiors that canonical recognition was “not a priority” when compared to the disagreement about how to handle interpretation of Vatican II. I was recendecently told that the status of SSPX ultimately revolves around the definition of “crisis”. That Lefevre anointed bishops under the cannon law that allows a bishop to do so in cases of crises in the church. Is this accurate? If so, 50 yrs after V2, it is hard to argue that the church is indeed in crisis, and it is reasonable to assume it was so at the time of Lefebvre’s decision, though much less visible. Would love to know if the original statement is accurate. They are indeed. What weird times we live in that we will stick with a failed agenda so tenaciously and consistently. Imagine if we were half as tenacious about remediating hunger or homelessness or rotten schools. So, Fr Z, if I might want to attend SSPX Mass because I think it is spiritually harmful for my young children to see 400 parishioners at any given N.O. Mass approach the Eucharist in shorts, flip flops, sports jerseys while they are distracted by singing bad hymns from the Gather hymnal (thus potentially unintentionally giving scandal to my children by their lack of reverence for our Eucharistic Lord) and it would be better for my young impressionable children to see fewer SSPX faithful approach the Eucharist as reverently as Moses approached the burning bush—that is ok? However, if I want to go to SSPX Mass because I’ve decided that the now clearly visible fruit of Vatican 2 and N.O. reform of the liturgy is putrid and destructive and this implies a fundamental flaw (Modernism) in the V2 documents and these allowances of modernism should be rejected—this is not ok as it tends toward schism? Man-0-words, I would like to have someone point out which canons in Canon Law specify an exception to the standard rule about consecrating bishops – which is that one is only allowed to do so under the consent / approval of the Holy See. My suspicion is that there is no canon that mentions a specific exception to this rule about consecrating bishops in a time of crisis; rather, the canons that mention a _principle_ of exceptions to usual norms for emergencies. Last year I received a letter from Ecclesia Dei. They clearly state that a Catholic may not fulfill neither a Sunday nor a Holy day of obligation mass by attending an sspx mass. allenmurphy, this is very odd. As far as I have ever seen, the Church law about assisting at Mass on Sunday does not specify a rule that could be used to deny the satisfaction of the requirement by attending an SSPX priest’s mass. The mass is valid, the priest is a priest of the Latin Church, the rite is an approved rite; what’s the problem? Would be nice to see the rationale offered. As Fr. Z hints, it could be wrong to assist at the mass of an SSPX priest if one does so with the wrong intentions: for example, if one does so precisely out of a schismatic desire to reject communion with Rome. But then the problem is in the obtuse intention of the individual in WHY he is doing this, not in the mere act of going to the mass of an SSPX priest. As an attorney weighing the totality of the evidence – the spiritual and liturgical state of most (not all) NO parishes – and the spiritual and liturgical state of the SSPX – I can’t see why attendance at a SSPX Mass – if the attendee simply wishes to receive the full and unambivalent benefits of the Sacrifice of the Mass – can in any way considered wrong. In fact in extreme cases – where the only option is attendance at a NO parish that endangers the faith of parishioners and their children ( I think most of us are familiar with these situations) – SSPX Mass attendance is absolutely the correct thing to do. As a coda to the above, I have never attended a SSPX Mass.